As NBC is in the midst of trying to figure out what the hell still works for them as far as ratings go, they have announced two of their fan-favorite shows are officially coming to an end after next season. The network’s full 2014-2015 lineup included the announcements that Parenthood’s Season 6 and Parks and Recreation’s Season 7 will be the final ones for both. I think a big group “aww” is in order here, but not the same kind of “aww” that Community turned into a catchphrase, because we already did it that way when Community was cancelled. It’s no big surprise that both shows were officially renewed, given each’s popularity among audiences. Technically, though, that popularity has rarely been reflected to make either series a ratings bonanza, and NBC has cancelled acclaimed series before. And for a while there, it looked like Parenthood was on shaky budget-crushing ground. Given its large, talented cast, Parenthood is one of NBC’s most expensive series, and the network had been mulling over a solution for it. The first way was to cut the episode order down from 22 to 13 for Season 6; the thinking then turned to asking cast memebers to take a bit of a pay cut by only appearing in nine episodes apiece. The press release makes no mention of what kind of an agreement the network and stars arrived at, but at least we can be sure that we’ll see more to come from the Bravermans’ attempt to open a magnet school, Haddie’s lesbian outing, Amber and Matt’s potential rekindling and more. 13 episodes should be enough to do it, given Parenthood’s writers have gotten accustomed to NBC’s insistence on mucking about with episode counts for the series’ entire run. 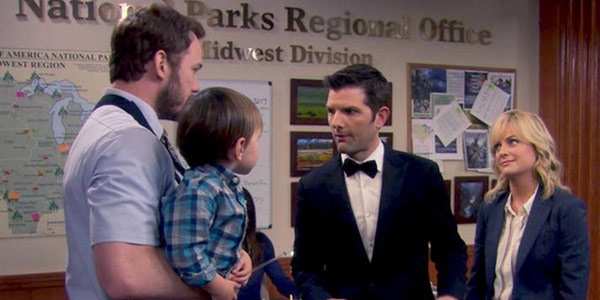 We all pretty much thought that Parks and Recreation only had one more season in it, especially after the awesome way the Season 6 finale shifted the timeframe forward to a point where Leslie and Ben are fully into their run as parents of triplets, where Leslie is a success in her new (to us) job as a higher-up in the National Parks Department. It’ll be a great way to start Season 7, assuming they don’t renege on the promise of “light sci-fi” to jump back into a pregnancy story back in Pawnee. Either way, though, as long as Ron Swanson is there to shed primitive light on everything, I’m more than game. Expect to treat yo self when both shows to return to NBC Thursdays this fall, presumably with a set of fresh faces, as the network attempts to recapitalize on the night of comedy it once ruled with a Seinfeldian fist.